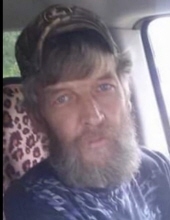 James Dale "Reno" Chandler, age 58, of Bulan, KY passed away on March 25, 2019 at the Hazard Medical Center. James was born on May 01, 1960 to the late James Edgar Chandler and the late Nell Couch Tackett. He is also preceded in death by one sister: Sharon Chandler and two brothers: Billy Wayne Chandler & James Edward Chandler. He is survived by two sons: Joshua Chandler (Sarah) of Hazard, KY & Jordan Kyle Chandler (Megan) of Bulan, KY; two sisters: Barbara Kaye Chandler of Bulan, KY & Kim Chandler of Bulan, KY; two grandchildren: Jocelyn Chandler & Aleyna Chandler along with a host of nieces, nephews, family & friends. To send flowers or a remembrance gift to the family of James Dale "Reno" Chandler, please visit our Tribute Store. "Email Address" would like to share the life celebration of James Dale "Reno" Chandler. Click on the "link" to go to share a favorite memory or leave a condolence message for the family.